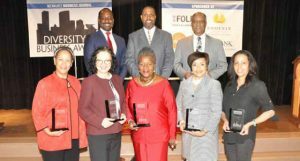 On Tuesday, March 20, 2018, The Milwaukee Business Journal hosted its annual “Diversity in Business Awards Luncheon” at Tripoli Shrine Center, 3000 West Wisconsin Ave. The Diversity in Business Awards salute the spirit of entrepreneurship, growth and optimism of companies and individuals who are positively impacting central cities in southeast Wisconsin. Pictured are some of this year’s honorees (back row, from left) Scale Up Milwaukee Executive Director Elmer Moore, Jr.; Historic King Drive BID No. 8 Executive Director Deshea Agee; Hurt Electric, Inc. President and Majority Owner Henry Hurt; (bottom row, from left) Gilbane Building Co. Vice President and Director of Diversity Linda Graves; Hellermann Tyton President Terry Tuttle; Lifetime Achievement Award winner WEC Energy Group Vice President Local Affairs (retired) Thelma A. Sias; Athena Communications, LLC. Principal Consultant Tammy Belton-Davis; and Fyxation Bicycle Company Co-owner Jessica Ginster.